Multi Family Zoning already in place on this lot. Zoned C-5, see attached document.. Desirable CR-5 zoning allows for large scale multi-family development. One acre lot perfect for your new home. Located in the county but close to town and shopping. 1.94 acres of desirable CR-5 Zoning, allowing for a large scale multi-family development. 6500 SF A-1 Light Industrial lot near airport. Many uses.! Great Investment! 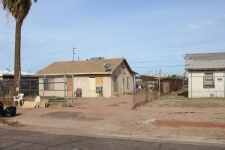 3 duplexes on City Water & Sewer old Downtown Kingman!